The Real Dragon of the Pleistocene–Megalania! Illustration of Australian aborigine confronting Megalania. The other day, I labored for hours cleaning out a closet and in the process discovered an old issue of Scientific American that featured an article about Komodo dragons. Few people are aware of a now extinct Pleistocene relative of Komodo dragons that formerly dominated the continent of Australia. Even scientists know little about Megalania priscus (the giant ripper lizard) because a complete skeleton has yet to be found, though disarticulated remains have been recovered from south Australia, New South Wales, and Queensland, proving that it was a widespread top predator on the continent during the Pleistocene. This monster grew up to 18-23 feet long and a full grown adult weighed between 800-1200 pounds. It would have easily destroyed and consumed any of the Australian megafauna, such as diprotondontid (a marsupial rhino), giant kangaroos, and marsupial lions. Megalania became extinct about the time man appears in Australia’s archaeological record 40,000 years ago. The extinction of Australia’s megafauna is closely tied to man–both overhunting and anthropogenic fires disrupted the ecology of the continent. Fortunately, for scientific knowledge, the Komodo dragon still survives on a few islands in Indonesia, and because it’s a close relative, it affords us an otherwise impossible opportunity to understand how megalania survived. Komodo dragons (Varanus komodoensis) are a member of the varanid family of lizards which includes monitor lizards from Africa and goannas from Australia. The varanid family is more closely related to snakes than other lizards are, and they’re probably close cousins to the aquatic mosasaurs that swam the Cretaceous seas off Georgia’s coast. The varanid lizards first evolved late in the Eocene. During the latter part of this era and throughout the Oligocene, monitor lizards even colonized North America, where it’s possible an undiscovered extinct species as large as the Komodo dragon may have lived in Georgia, but the paucity of land fossil sites in state may keep our knowledge of such a species in the dark. Giant ripper lizards were much larger and bulkier than Komodo dragons, and they had better vision, but otherwise were similar Most of the following interesting facts, gleaned from the rediscovered issue of Scientific American about Varanus komodoensis, were probably true for megalania as well. –Komodo dragons grow up to 6-9 feet long and up to 300 pounds, making them about 1/3 the size of megalania. –They may have evolved their large size as an adaptation to hunt the now extinct pygmy elephant (stegodon) that used to live on isolated Indonesian islands. –Komodo dragons hunt deer, wild boar, water buffalo, feral goats, and other Komodo dragons. This cannibalism keeps juveniles in the trees most of the time because adults are too heavy to climb. –They have poor vision and are only able to hear sounds in the 400-2000 hertz range compared to the human ability to hear sounds in the 20-20,000 hertz range. This means they can’t hear low sounds or high pitched screams. Instead, Komodo dragons find their prey with their long forked tongue which along with their Jacobson’s organ helps them locate potential meals. –Komodo dragons are ambush predators, staying still in heavy brush until their prey practically stumbles upon them. Then, they rush their victims, bowl them over, and go for the neck. Formerly, scientists believed the fifty kinds of toxic bacteria that infest their saliva facilitated the deaths of their intended meals, because oftentimes a deer or buffalo will regain footing and run away, but die of septic shock within days while the lizard follows it around. But a recent study by Australian scientist, Bill Fry, discovered that Komodo dragons actually have poison glands. (Megalania also had poison glands.) Dr. Fry compared the biting power between Komodo dragons and salt water crocodiles and determined that the former has relatively weak jaws, like saber-tooth cats. When they bite, Komodo dragons use their powerful bodies to pull and tear, causing damage, also like saber-tooth cats. The injection of an anti-coagulant poison keeps the blood from the gaping wound from clotting, and the prey animal dies from loss of blood. The low blood pressure keeps them from escaping, as the animal usually lays down and goes into shock. –Komodo dragons can eat up to an incredible 80% of their body weight in one sitting, and they’re able to unhinge their jaws like snakes (and mosasaurs) to help gobble down their meal. They eat the whole animal, abstaining only the feces within the intestines which they vigorously shake loose. –Komodo dragons can go for as long as 8 months without water, and they mostly drink from hog wallows. –Reptiles have lower metabolism than mammals. This gives Komodo dragons a competitive advantage over mammalian carnivores on islands because they can survive in an ecosystem with lower prey densities. –Komodo dragons battle over mates by biting and pushing up against each other. They have forked penises known as hemipenes. When they mount a female from her left hip, the right fork is inserted and vice versa. –The European legend of the dragon is likely not based on this species for it wasn’t discovered by Western science until 1910. Legends of dragons in western culture are probably based on the existence of dinosaur fossils for which they had no logical explanation. –I have two words for cryptozoologists’ claims that megalania still exists: No Way. There’s no way an 18 foot lizard with a poisonous bite could still exist in our modern overpopulated world without people knowing about it. What was the fishing like during the Pleistocene? I’ve often wondered what the freshwater fishing in Georgia waters would have been like before people. Aside from a passing reference with no citation in a book about Archaic Indians, I’ve been unable to find any information about possible extinct species of Pleistocene fish. Fish bones are not rare in the fossil record, but it’s difficult to discern the difference between species, and when Ice Age fossil fish specimens have been identified, invariably they’re attributed to species still extant. Accordingly, fish did not suffer a mass extinction event, but there probably are a handful of as of yet unknown species that did become extinct. Without human fishing pressure, pollution, and dams that interfere with spawning, fish populations must have been very high and diverse–the composition varying with changes in river patterns and habitat. There were two main alternating cycles of climate during the Ice Age. Cool, arid times occurred when the Laurentide glacier expanded, locking up more water in the atmosphere, creating droughts that lowered the water table. Rivers, swamps, and wetlands shrank in size, but the ocean receded farther to the east, and the fresh water rivers excised valleys over land that are visible today underwater. Actual river habitat expanded, but oxbow lakes and swampy habitat decreased as the rivers became more braided. Rivers were more like chains of many branched channels, some interconnected, some separated by sand dunes. Conversely, during meltwater pulses when the Laurentide glacier melted and retreated, more moisture existed in the atmosphere, creating rainy conditions that filled up the rivers which would begin to meander again, forming oxbow lakes, wetlands, and swamps. To contemplate Pleistocene fish, I’ve been studying Fishes of the Middle Savannah River Basin by Barton Marcy, Dean Fletcher, and F. Douglas Martin. It’s a fantastic book. Too bad there’s only one copy in the entire east central Georgia library system. I had to request an interlibrary loan to get the one I’m studying. I learned many interesting and surprising facts about the local fish fauna. –Brook trout naturally occur in the headwater streams of the northern Savannah River, but not in the Middle Savannah River Basin (MSRB) where the water is too warm for this species to exist. During the Ice Age, I suspect waters were cool enough for them to survive, possibly as far south as the Augusta shoals. I also theorize muskellenge lived farther south during the Ice Age. –Historically, lampreys, that primitive parasitic fish that attaches itself and feeds on bigger fish, occurred north of Augusta. This species hasn’t been recorded recently here–a possible victim of decreased water quality. –The EPA recommends not eating fish caught in the Savannah River. Too much mercury originating from coal power plants located in the northern industrial states has been deposited in the river. Fish living in the Savannah River Plant creeks and ponds are also radioactive. This is another reason why I long for the days before people–we can’t even eat good freshwater fish. –Flounder, hog chokers, mullets, tarpon, and needlefish–all ocean fish–swim up to the MSRB seasonally and are common here during some times of the year. This surprised me. –The bluehead chub is an interesting keystone species. Many other species, such as the yellowfin shiner lay eggs in their nests which the chubs vigorously defend. This is more of a symbiotic relationship than a parasitic one because the increased number of offspring dilutes predation by other fish. –Sturgeon are endangered from overfishing and habitat loss. Fishery biologists stocked them in the Savannah River, but these stocked fish didn’t always imprint on the Savannah River and were found in other rivers. –Longnose gars are symbiotic nest associates with small mouth bass. –Eels can travel over land during moist nights to reach other waterways. –Quillback suckerfish are related to and look just like buffalo fish. –The population of white catfish actually declines when humans clean up water conditions. This allows different species of fish to return and compete with them for space. Catfish are more tolerant of pollution than other species. –Swampfish are a nocturnal species that prefers acidic swampy waters. They’re a member of the cave fish family, some of which live in underground well water. –Top minnows can respirate in oxygen rich surface water, enabling them to survive in oxygen poor environments. –Mosquitofish are related to guppies and killifish. They bear live young. They eat mosquito larvae and parasites that they pick off alligator skin. –Many species of bream, such as the pumpkinseed sunfish, have smaller parasitic morphs that spawn in larger males’ nests. They sometimes accomplish this trickery by mimicking females. Parasitic morphs occur frequently in overfished waters and are evidence supporting the theory of evolution. –The Christmas darter has red and green stripes–the colors of Christmas. –Yellow perch are not native to the Savannah River, the southern limit of their natural range is the Santee River. However, they have been successfully introduced. They probably also occurred in the Savannah River during the Ice Age because there is a disjunct natural population in the Mobile delta in Alabama. Yellow perch begin dying when water temperatures get too high. I theorize a dramatic warming event during the early Holocene extirpated them from the river. –The hog choker, a small species of sole that probably tastes good, used to be discarded by pioneer farmers who fed them to the hogs. The hogs had trouble swallowing the tough scales, hence the name. Pleistocene fish fossils have been recovered in Georgia from Kingston Saltpeter Cave, Little Kettle Creek, and most coastal sites. Incidentally, kettle is an archaic word meaning fish trap. Appalachian balds may be relic landscapes of the Ice Age. Scientists theorize that they formed during the coldest stages of the Wisconsinian Ice Age when wind, cold, and aridity combined to kill trees on the tops of high elevations in the southern Appalachians. 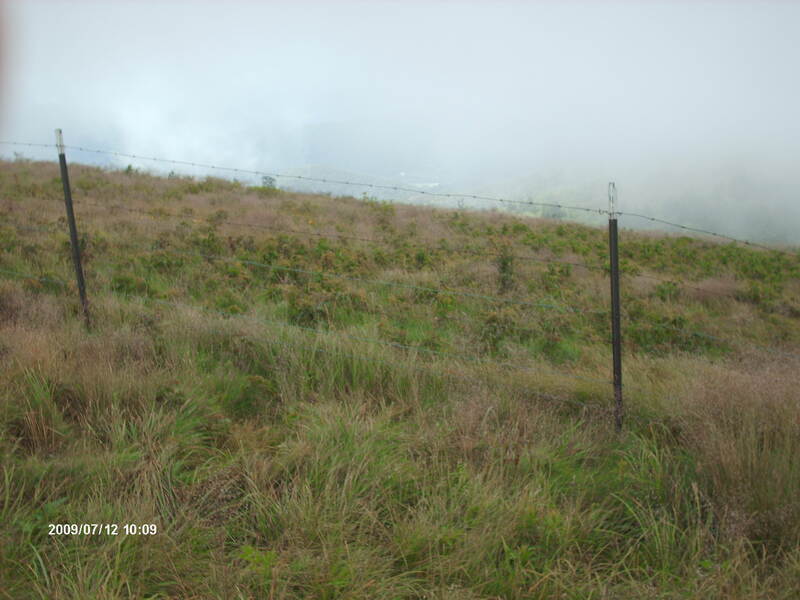 Grass, however, was able to colonize and grow in this habitat. Grazing animals such as mammoths, bison, musk-oxen, horses, elk, fugitive deer, caribou, and llamas kept trees from regrowing by trampling the ground and destroying tree saplings. The grass, itself, once established, prevented trees from re-colonizing the area. The root systems grow thickly and the grass surface stops tree seeds from even coming into contact with the soil. 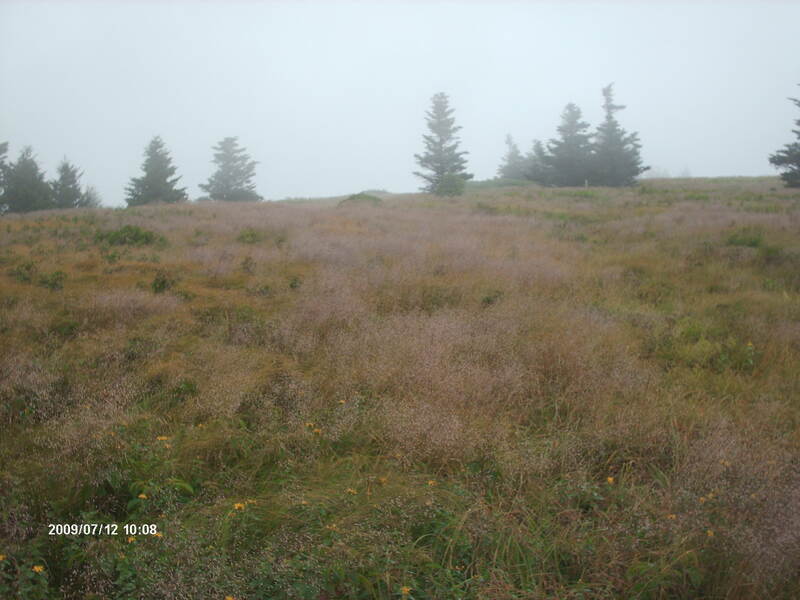 Relic plants growing on Appalachian balds are disjunct species that today are more commonly found in Canada, New England, and the upper midwest; and they’re absent from the lowlands surrounding the grassy balds. Mountain oat grass is the dominant species, but there are many more. After the extinction of the megafauna, bison and elk remained and along with Indian-set fires helped maintain the balds until English settlement. The colonists used the land for grazing livestock, but at the beginning the the 20th century, farming here became uneconomical, the land was abandoned, and trees have started to encroach upon the land. The U.S. forest service is trying to maintain these unique ecosystems with goat grazing and controlled burns, but many already have been lost to reforestation. Curiously, mature hemlock forests grow right next to the balds–a stunningly different environment. These shady habitats have a largely bare undergrowth, though ferns and moss occur in patches. 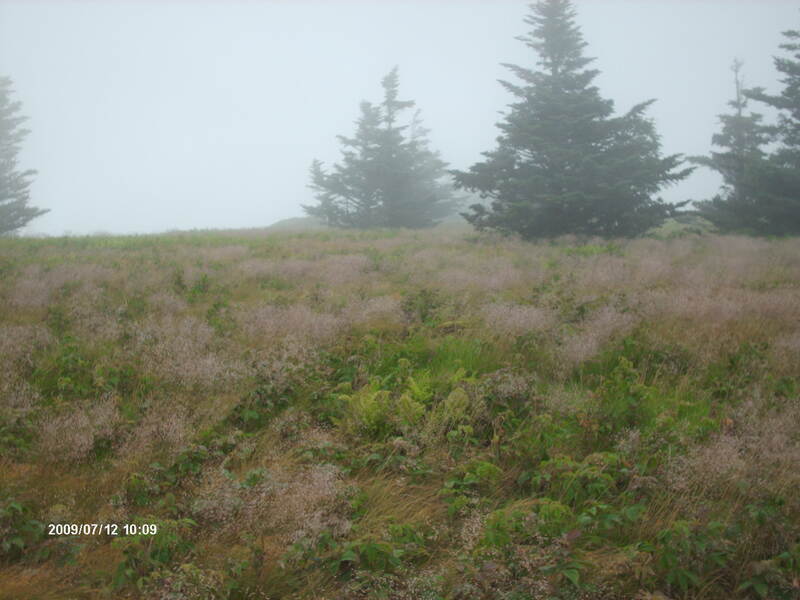 For my book I took a number of pictures at the Roan Mountain bald which is on the border of North Carolina and Tennessee. One of these is on the back cover of the book. I think they’re really nice pictures, though I’m no professional photographer. Unfortunately, the ones I have on the inside of my book had to be converted to black and white so the book would be affordable, but here I can post them in color on the internet for free. These are beautiful landscapes and must resemble what much of Georgia’s Pleistocene looked like, minus the extinct and extirpated mammals. Georgia likely had lots of prairies and savannahs with a few scattered trees. Nevertheless, Georgia was still mostly forested, according to pollen studies. There were probably open parkland woods, closed canopy forests along streamsides and rivers, and hammocks of trees surrounded by meadows and prairies. The scattered trees in the photos are hemlock and white pine. 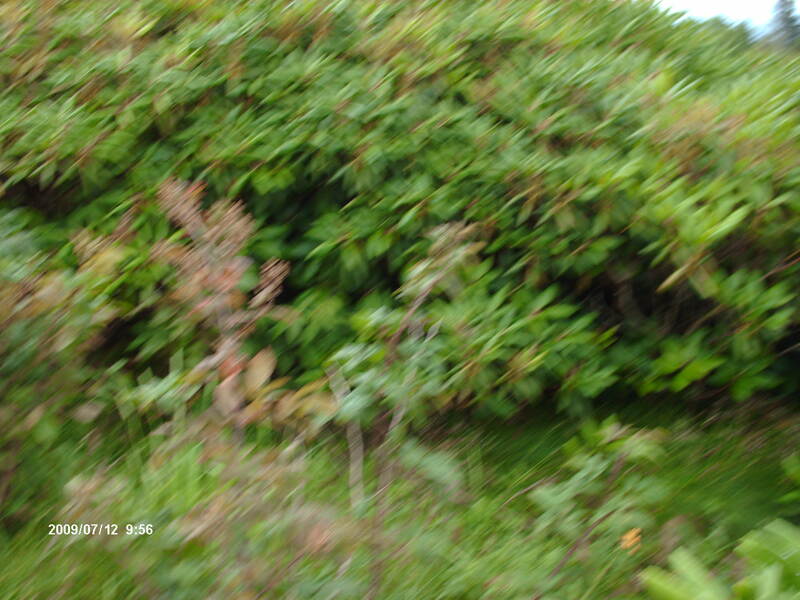 The first photo is of a heath thicket. Some balds are covered with shrubs rather than grass. 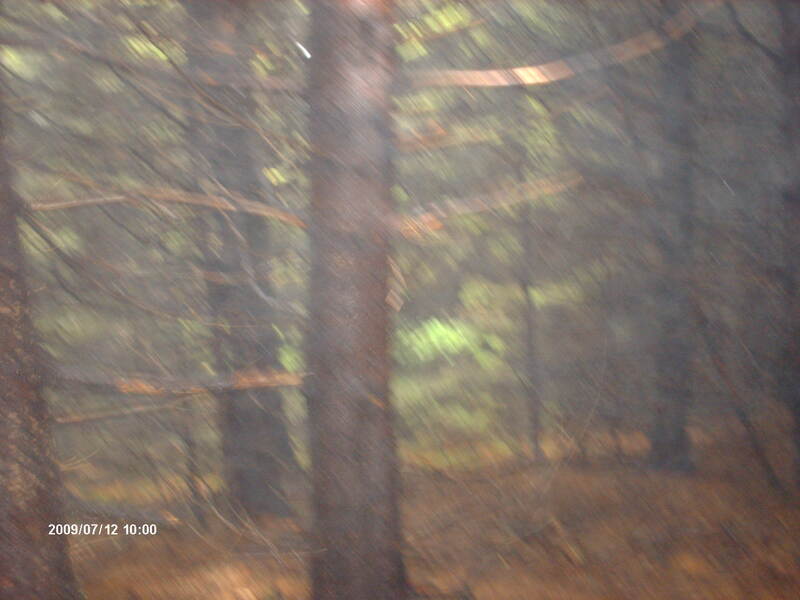 The last photo is of a hemlock forest. The grassy balds are the middle three pictures. After I finished formatting Georgia Before People I happened to review the list of fossil birds recovered from the La brea tar pits in Los Angeles and realized I had omitted mentioning a spectacular species of extinct eagle that probably occurred in Georgia as well. I was too lazy to go back and add a discussion of this eagle into my subsection about Pleistocene birds. (Take my word for it–formatting a book line-by-line is a pain.) So here I’ll mention it to make up for my omission. Woodward’s eagle (Amplibuteo woodwardi) was North America’s version of the harpy eagle which today lives in the jungles of South America and preys on monkeys and tree sloths . Unlike its modern relative, Woodward’s eagle likely was well adapted to hunting the open Pleistocene landscapes rather than closed canopy jungles. Evidentally, it couldn’t survive the ecological changes that occurred at the end of the epoch. Its extinction may have been related to the extinction of the megafauna which probably provided a great deal of food as carrion when the large beasts died, though I’m sure this species of eagle was an active hunter as well. In addition to the fossil remains found in California, Woodward’s eagle specimens have also turned up in Florida and Cuba, so it’s safe to assume they probably lived in Georgia. I did mention the hawk-eagle (Spizaetus grinnelli) in my book but didn’t realize at the time that it had another common name–Grinnell’s crested eagle. It has also left specimens in California and Florida, meaning it likely lived in Georgia. California and Florida have outstanding fossil sites that are very comprehensive compared to those in Georgia for a number of reasons. California has the tar pits; Florida has lime sink lakes and caves where the basal chemistry preserves bones. Normally, bird bones are particularly rare compared to mammal bones because they get crushed into powder when buried under sediment. Florida’s fossil record also has evidence of the long-legged eagle (Westmoregyps daggetti) which occupied an ecological niche similar to the African secretary bird. What a neat bird this was–an eagle with long legs that hunted on the ground like a road runner rather than dive bombing from the air like all of its modern relatives. The Florida specimens, however, date to early in the Pleistocene, and it’s unknow whether they still survived in the southeast late in the Pleistocene. Oh what a wonderful wilderness that used to be. Next up: photos of an Appalachian balds–relic landscapes of the Pleistocene. The purpose of this blog is to promote my newly published book–Georgia Before People: Land of the saber-tooths, mastodons, vampire bats, and other strange creatures. I will use this blog to highlight some points that I didn’t cover completely in my book, or to discuss new findings that didn’t make it into my book. Think about this: Every animal and plant that you see today is a Pleistocene survivor. All extant species lived during the Ice Age, otherwise they wouldn’t be here today. Oak trees are among the most abundant living species found in temperate North America today. Pollen studies from Georgia and other southeastern sites show that oak trees were fairly common here during the Ice Age as well. Oak consistently makes up about 12% of pollen samples at various Pleistocene sites in Georgia. Though pollen studies have some drawbacks (which I discuss in my book) when estimating actual tree populations, this means that about 1 in every 8 trees in the Pleistocene forests of Georgia were oaks. Like today, they shared the landscape with southern pines and hickory, but unlike today, Pleistocene forests in Georgia also consisted of northern species of pines and spruce trees as well, at least in the north and central parts of the state. A more equable climate with cooler summers and mild winters allowed more species of trees (as well as small animals) to co-exist than do in today’s Georgia. Oaks require a great deal of sunshine to germinate and do well. This means that in Pleistocene Georgia, there were plenty of sunny locations for oak trees to sprout up on. This implies an open woodland kind of forest rather than the closed canopy woods that began to dominate in the Holocene. Fire, drought, ice storms, wind, and megafauna browsing and trampling are the factors that kept Pleistocene landscapes more open. Man is the reason oaks continue to thrive in today’s environment. Men cut down trees, clear the land for agriculture, than abandon it, thus allowing oaks to return. I visited protected areas in the Appalachian mountains of North Carolina last summer where there has been little lumbering for the past 100 years. Surprisingly, the forests here have few oaks. The dominant trees are maple, tulip, beech, white pine, and hemlock. These trees shade out oaks. This makes me think that the Great Smoky Mountains National Park has less wildlife than it should because the habitats are undisturbed. Oak is an important mast tree–the acorns providing an important food source for all kinds of wildlife. After the blight wiped out the chestnuts, oaks became even more important, but without lumbering or fire to open the landscape, the supply of acorns is declining, and accordingly, the wildlife in this park is a pitiful remnant of what it should be. Park officials probably wouldn’t agree with me when I say some of it should be lumbered for the purposes of diversifying habitat. One more thing to consider about oaks in Georgia. I’ve studied the range map of the bur oak–this is a tree that likes rocky calcareous soils and thrives in the cross timber region of midwestern North America where prairie meets woods. A very small scattered population exists in northern Alabama and Mississippi, but none have been found in Georgia. It’s possible that during the Pleistocene, bur oaks were more widespread and may have occurred in state. Unfortunately, plant macrofossil sites in Georgia are so rare we’ll never be able to confirm my suspicion. Next up: A discussion of Pleistocene eagles. You are currently browsing the GeorgiaBeforePeople blog archives for March, 2010.